Giving each whiskey (and whisky) I try a final grade, but only after reaching the bottom of the bottle. After all, just one drink is never enough! Store picks always grab my attention. More and more they are becoming the target of bourbon hunters, representing more attainable trophies than the Pappy's and the BTACs that everyone else is looking for. They're unique to that establishment, creating rarity based on geographic limitations alone, and frequently they are fantastic pours, better than the standard offering. So, when I was in one of my local shops, Liquor 'n' Wine, perusing what was new that they got in, trying to decide whether I really wanted to overpay for another bottle of Rock Hill Farms, the little gold sticker on the side of a bottle of otherwise normal-looking Barton 1792 Small Batch caught my attention. On closer inspection, I realized it was indeed a store pick single barrel select. And even better was the price - $28.00!!! Buying this bottle at that price was a no-brainer. I like the regular offering, and for this price, I couldn't turn down the possibility of lucking into something unique and delicious. The nose was soft, smelling of sweet vanilla and caramel. Though not pungent, it vividly reminded me of Cow Tales, those soft, caramel ropes wrapped around a vanilla, nougat center. Needless to say, it was a very pleasant nose. The flavor was vanilla with a light cinnamon spice on the back end. It was a full-bodied bourbon, really coating the mouth and the flavors coming in strong. 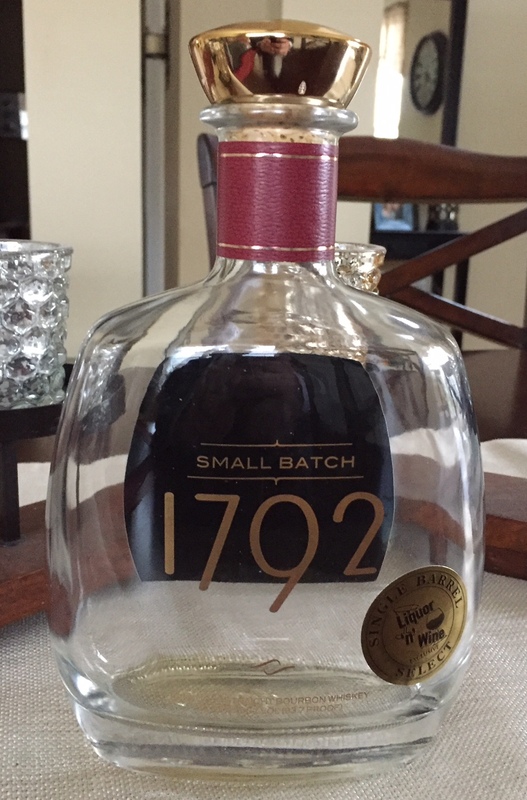 This was in sharp contrast to the standard 1792 Small Batch. It also had an almond nuttiness, with a slight nutmeg/woodiness to it. This combination gave it an odd sort of tang to it. I wasn't overly fond of this "tang," though I could see how some people would enjoy it. To me it just interfered with the flavors that I really wanted to enjoy. Throughout the bottle the primary characteristic that stayed true was the cinnamon spice. The bourbon carried a decently long, mild spice. This spice was accentuated as the almond flavor seemed to have morphed into a more black cherry note about half-way through the bottle. This is when I really started enjoying it. Although it wasn't a knock-your-socks off store pick, no diamond in the rough, it was still a very good bourbon. If this were available regularly at this price, it'd be a no-brainer as far as picking a regular sipper. Though there are certainly better bourbons to be had out there, it'll be difficult to find many for this price.